Home > Recent > Big Biscuit Brands Releasing Biscuit Thins, But Are They a ‘Healthier’ Option? Big Biscuit Brands Releasing Biscuit Thins, But Are They a ‘Healthier’ Option? Biscuits are one of life’s little pleasures. Whether you’re a chocolate-lover, all about the custard creams or prefer the plain (*cough* boring) Rich Tea-type, biscuits are the perfect accompaniment to your cup of tea or coffee. Recently, new biscuit ‘Thins’ have made their way onto the market, which strike up questions as to whether they’re healthier. And the simple answer is, per biscuit, yes they are, because they’re smaller, and lighter, and so will have a lower calorie and fat content. But let’s be honest, no one can just eat one biscuit without wanting another. Many see the fact that the biscuits are thinner as an excuse to eat more of them, kind of defeating the point. But here are the facts and figures which put regular biscuits and thins side-by-side. 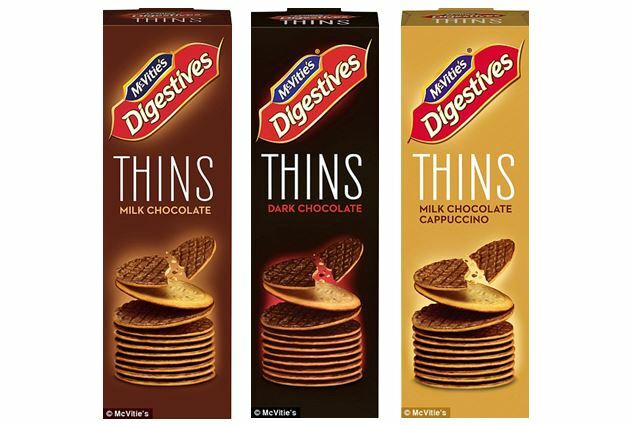 Biscuit-giant McVitie’s have recently brought out Digestive Thins in 3 chocolatey flavours: Dark Chocolate, Milk Chocolate, and Milk Chocolate Cappuccino (which would be more like a Mocha right? either way, a hint of coffee). The Thins weigh 63% less than regular chocolate digestives, at 6.2g per Thin compared to 16.7g per standard biscuit. If you look at fat content when determining the healthiness (or not) of a product, the fat content is significantly less per biscuit, which is great news. Regular Chocolate Digestives from McVities have a whopping 4.1g of fat per biscuit, while the Thins have only 1.5g! Hurrah, healthy-ish sweet treats! As reported by Refinery29, McVitie's said the Thins are aimed at people with healthy intentions and younger consumers who feel the need for "little, yet indulgent rewards". Yes, the difference in fat and calories per 100g is small but the Thins being marketed as healthier is a tad deceiving. While a healthier option per biscuit, with less than half the amount of fat per biscuit, if you manage to eat 100g of the Thins (easily done on a Tuesday night in front of the telly), you’ve been fooled. 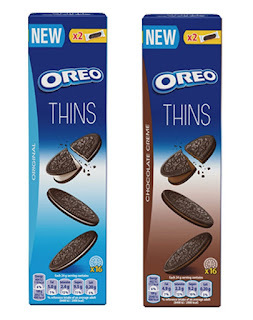 Popular crème-filled biscuit brand Oreo has also jumped on the bandwagon, launching Oreo Thins in the UK last month. 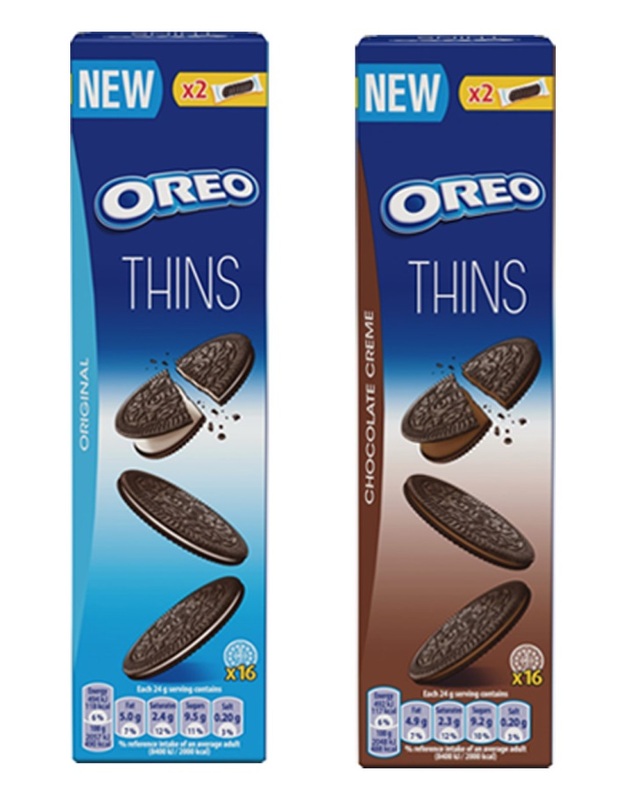 Described by the company as “thinner and more delicate Oreo cookies with a layer of creamy filling”, the Thins are available in the Original Vanilla flavour, as well as Chocolate Crème. The biscuits are advertised as ‘per 4 Thins, 24g’ in nutritional information, at 5g of fat, but if I’ve done my maths correctly, that means there’s 1.2g of fat per biscuit. That’s only one gram less fat that the Original Oreo, at 2.2g of fat per biscuit. Again, looking at the 100g nutritional values aside the original, chunkier Oreos, the Thins have a tad more calories and grams of fat. A miniscule amount yes, with Vanilla Thins at 490kcal per 100g, compared to Original Vanilla at 480kcal per 100g. Maybe I’m being dramatic, but seeing how the Thins are marketed and debated as a ‘healthier’ biscuit with lower calorie and fat content, the numbers are telling. If you have will-power to only stick to 2 biscuits to dunk into your tea, then you’ve achieved the lower-calorie snack. But if like me, you can’t put the packet down after one, there’s little achievement on the healthy scale. I’m more of an Oreo Double Stuff gal; when it comes to biscuits, go hard or go home.